Since 2003 Colibri has been manufacturing high speed air bearing spindles for the semiconductor industry. They have a reputation for quality and precision and that reputation continues to grow. We are very familiar with their various lines of High-Speed spindles. The above Colibri HF80L13D60 spindle was sent to us for repair. Our customer had reason to believe there was an internal coolant leak. Upon receipt we quickly confirmed their suspicion. The spindle immediately failed our pressure tests. After disassembling the spindle we located the leak. Coolant was leaking past one of the stator jacket O-rings. Over time each O-ring had become stiff and brittle. One of the O-rings eventually allowed Coolant to seep past around it and into the spindle. Upon disassembly stator O-rings were brittle! Inner Axial bearing was damaged. Once moisture migrated into the spindle it lost axial lift and the rotating shaft seized against the inner axial bearing, pictured above (right). We machined the thrust surface flat and reestablished the air groove. Once this surface was repaired, we cleaned the spindle, verified all air orifices were clear and replaced all O-rings with new. The spindle passed initial scrutiny and was able to be test run up to maximum operating speed. After minimal trim balancing the spindle ran like new! This spindle shipped four days after we received it. Our customer was happy with the quick turnaround time but they were thrilled with our thoroughness and attention to detail. The spindle not only ran like new but it looked like new! 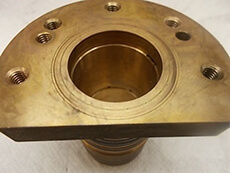 For expert Colibri spindle repair, please email or call us at 603-483-0333 for a free, no obligation quote. We offer one-year warranty and Quick-Turn-Around. We are fast, experienced and our work is guaranteed! !